In an attempt to draw interest away from Apple's iPad, Microsoft has set up a tablet comparison page that falsely presents the iPad as having a smaller screen than a Windows tablet with less screen area. Microsoft presents a series of four tablet devices running either Windows 8 or Windows RT, but the default comparison pits a full size 9.7 inch iPad against the 10.6 inch Asus VivoTab Smart. However, as noted by blogger Elliot Temple of Curi.us, Microsoft's comparison graphics are not to scale. "Microsoft has drawn a 10.1 inch tablet 36% larger than a 9.7 inch tablet," Temple wrote, pointing out that the iPad actually has a screen area of 45.16 square inches, while the Asus tablet is actually 3.5 percent smaller at 43.56 square inches, "not 36% more as Microsoft depicts." Microsoft doesn't just imply the Windows device is bigger; the site actually states that the ASUS VivoTab Smart "has a bigger touchscreen," when in fact it does not. Microsoft also points out that the Asus product has a lower battery life rating, is slightly thicker, and weights slightly less. One detail Microsoft doesn't mention: the current iPad has sported a Retina Display with a resolution of 2048 by 1536 for years now, while the new Asus Windows tablet has an "HD" resolution of just 1366 x768, more comparable to the original iPad from three years ago. 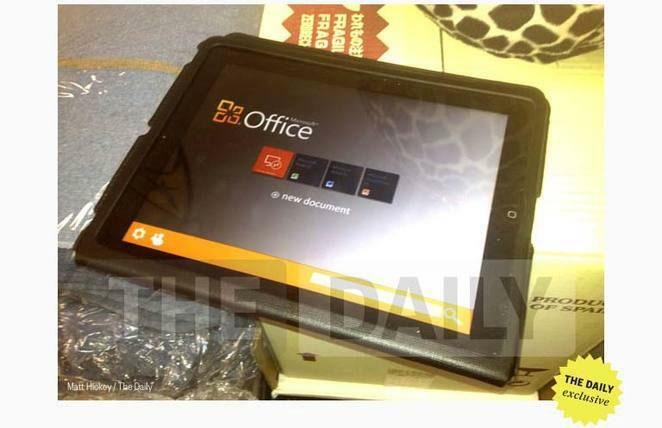 Microsoft also draws attention to the fact that "the only consumer Office app the iPad can run is OneNote," an interesting claim from the only company that has the power to port Microsoft Office apps to the iPad. The company is already rumored to have done this but is apparently withholding their release until all hope is lost for Windows tablets. Microsoft also notes that the Asus tablet ships with ports for attaching HDMI and SD cards; Apple sells such dongles separately but also offers the technology to access external screens and storage wirelessly via AirPort and iCloud. A fourth unfavorable comparison Microsoft makes is contrasting Apple's included 5GB of iCloud storage with the free 7GB it offers via SkyDrive. However, iPad users can access both Apple's iCloud and Microsoft's SkyDrive, meaning that it effectively provides 12GB of "free cloud storage" to anyone who wants to sign up for both. Microsoft lastly compares the two models on price, depicting the iPad as $699 in comparison to the $449 Asus tablet, both at 64GB. However, Windows consumes much more storage than iOS does, so the free space Microsoft is giving it also is taking away. On Windows tablets like the Asus, a full 8GB of storage is consumed by a "recovery partition," leaving, after Windows and other bundled software, just 33GB free, about half of the advertised storage. The list price of the Asus tablet is $499 ($420 on Amazon), and 64GB is the cheapest model available. Apple's full size iPad also starts at $499 (with models as low as $410 on Amazon). Apple's iOS also consumes much less storage, only around 4GB. A 32GB iPad has over 28GB free, making pure price per GB comparisons misleading. Microsoft also makes no mention of Asus' NFC feature, promoted as "tap and Explore: simple interaction with other NFC enabled devices" on the Asus website. NFC has failed to capture much attention among consumers a year after Google, Microsoft and their partners have tried to leverage it as a differentiating feature that Apple has chosen not to support. Microsoft spent two years reworking its failed Windows Slate PC efforts in order to more effectively compete with Apple's iPad, which has been eating its way into both consumer and enterprise markets, gobbling up conventional PC sales. The moves included a two pronged effort to target both desktop PC users with iPad-like features and a tablet-optimized version of Windows capable of running on more efficient ARM hardware like the iPad (but incapable of running conventional Windows software). Both efforts have failed to gain traction.